Now with your very own set of Hylian armor you’ll be able to safely save the Princess! 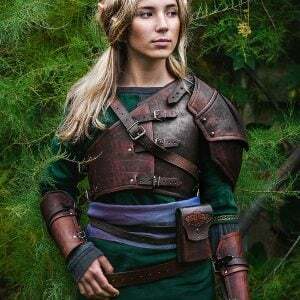 This set of custom made leather armor consists of a pair of bracers, shoulder, and back armor. 100% handcrafted by your measurements. It’s dangerous to go alone – take this! Always be prepared to strike down the mightiest of foes and rupee filled ceramic pots with this miniature Master Sword necklace. It’s even fully removable from its scabbard. This Breath of the Wild Traveler’s Bow and Ancient Arrow set is an amazing collectors piece and creates a beautiful display piece. The arrow even lights up so it looks like you could take down even the most terrorizing Hylian monsters.